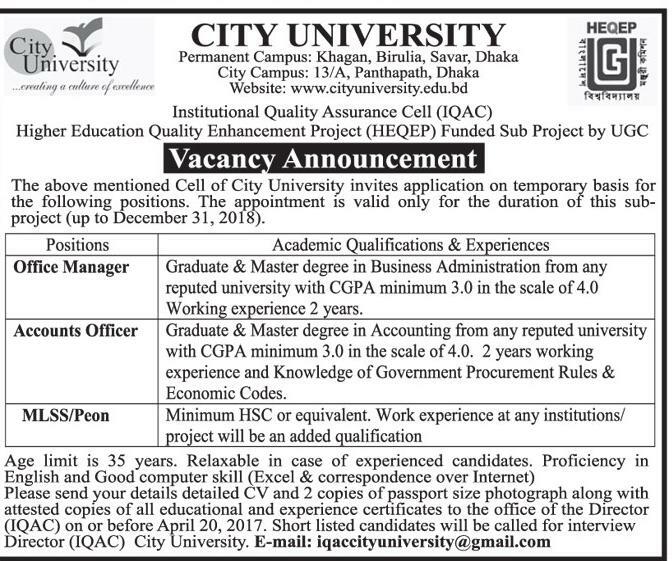 City University Job Circular 2017 has been published by Daily newspaper Bangladesh protidin and also find on my website BD Jobs Careers.City University (CU) is one of the top ranking Private Universities in Bangladesh having own Permanent Campus at Khagan, Savar, Dhaka and City Campus at Panthapath, Dhaka. A country develops its population through quality education to be productive human resources which becomes the drive engine of socio-economic transformation. CU is working towards “Creating of Culture of Excellence” in higher education at a very low/affordable cost since its inception in the year 2002.Recently the University looking new man power for various positions. Noted that its application deadline on 20 April 2017. If you are interested for University jobs in Bangladesh, no doubt it’s a good one. So, let’s check the City University Job Circular 2017 . Apply now!! Organization name: City University . Publication Date: 10 April 2017. Application Deadline: 20 April 2017. Salary: As per University policy. Jobs Source:.Daily newspaper Bangladesh protidin. This entry was posted in All Jobs, Private Job, University Job and tagged city university job circular 2017 by Bappy. Bookmark the permalink.